Below is a reprint of an article about the river mouth first published on the FOR San Bernard website on Sep. 13, 2011. Col. Christopher W. Sallese, pictured below, retired from USACE Galveston on July 9, 2013 and received the de Fleury medal. Retirement ceremony. 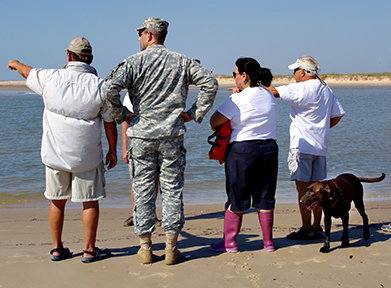 On September 12, 2011, an informal inspection and observation of the river mouth was done. It was attended by reps from the U.S. Army Corps of Engineers, Congressman Ron Paul, Texas Parks and Wildlife Dept., Texas Dept. of Transportation, Port Freeport, City of Brazoria, Friends Of the River and concerned river residents. Everyone agreed there is a problem. The Corps of Engineers is facing a reduced annual operating budget, cut by 50 million dollars for the gulf coast district. There may be a need for a complete enviromental impact study before anything can be done to reopen the mouth. The Corps is going to start the process on what may be required. This process will be lengthy. 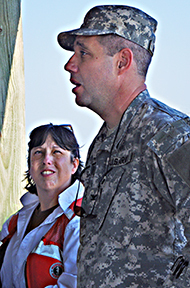 Michelle Matte, Operations Manager, U.S. Army Corps of Engineers listens to COL Christopher W. Sallese, District Engineer and Commanding Officer, U.S. Army Corps of Engineers, Galveston as he reviews what may lie ahead for the San Bernard. Standing on the beach at the Gulf, Col Sallese and Dianna Kile from Ron Paul's office, got a look at the sand buildup at the mouth of the river. I am just curious, has anyone determined why the river began closing in the first place? I remember playing on the beach at the mouth in the late 50's early 60's and it was very wide then.